Every season David Nichols (editor in chief of DC Pro Sports Blog) organizes the unofficial DC Chapter of Nats bloggers to do some surveying about will happen, and then a post-mortem about what happened. For 2014; here’s how the DCIBWA members voted in total. 1. Who will lead the Nats in home runs in 2014? Hard not to go with the kid Bryce Harper. I’ll predict he manages to stay healthy, stop running into walls, and hits 32 bombs out of mostly the middle of the order. Last year’s leader was Ryan Zimmerman, who I like for 20-25 homers again but not as many as Harper. 3. Who will lead the Nats in stolen bases? 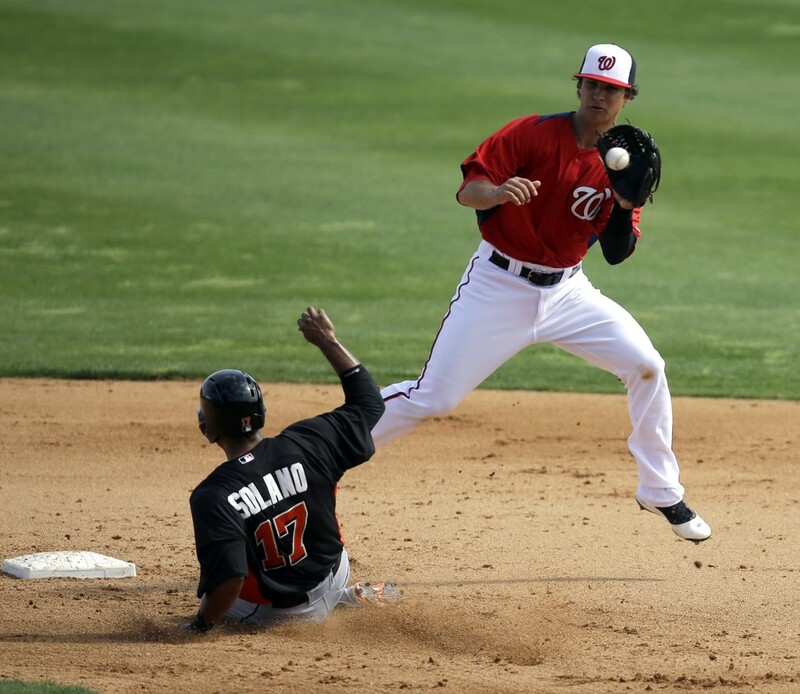 I’ll go with 2013 leader Ian Desmond again; Denard Span is the obvious choice here but he seems to have lost a step. All in all, speed on this team seems to be lacking on this team; will Matt Williams be a more- or less-aggressive manager on the basepaths? 4. Who will lead the staff in wins? 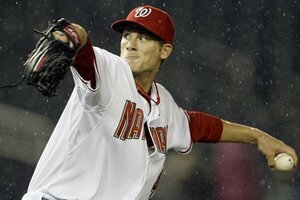 Stephen Strasburg, who I feel is destined for a break-out season with no leashes and no afterthoughts of his injury. 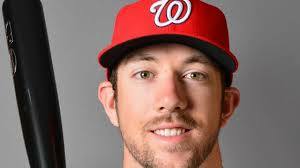 He’s two years removed from TJ recovery; when 2013 staff wins leader Jordan Zimmermann was in his 3rd year back he went 19-9 and got Cy Young votes. I predict a 20 win season for Mr. Strasburg, some serious consideration for a Cy Young, and a significant arbitration fight next off-season. 5. How many games will Ryan Zimmerman play first base? I’ll go with 10-12, maybe fewer. Perhaps once a week he’ll go over to the other corner. Something tells me that Adam LaRoche in a contract season will step it up and make it really tough to take his bat out of the lineup. And something else tells me that Zimmerman may return to his plus-defense now that his shoulder issues are seemingly behind him, and we’ll be talking about how we can stick with him at 3rd for the long haul when the season is over. (I may be eating my words on Zimmerman here; he’s already shown some air-mailing tendencies during Spring; such a shame that his arm is affecting his overall defense so badly). For what its worth, Zimmerman has played a grand total of 2 innings at first this spring. 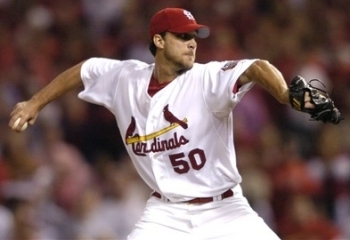 6. Who starts more games: Ross Detwiler, Taylor Jordan, Tanner Roark, Ross Ohlendorf? Tanner Roark. The winner of the 5th starter spot will pitch to a relatively non-descript league average for months, while the loser (Taylor Jordan) toils in obscurity in Syracuse, waiting for Roark to fail or someone to get hurt. Ross Ohlendorf‘s trip to the 60-day D/L means he’s likely a non-factor for the first half, and Ross Detwiler‘s trip to the bullpen looks permanent. (When I wrote the first draft of this in Mid Feb, it was Detwiler). Even given what has transpired at the end of spring (Fister’s D/L trip meaning both guys are in the rotation), I feel like Roark is going to stick when Fister comes back. 7. Who will get more at bats for the Nats this season: Danny Espinosa or Jamey Carroll? Danny Espinosa obviously, since Carroll has already been released. But even in my first draft of this post in Feb, I was predicting that Espinosa would win the backup middle infielder battle with Jamey Carroll. I just didn’t think the team was ready to punt on a former 20-home run guy with superior defense. 8. Which minor leaguer are you most interested in keeping tabs on this season? Instead of copping out and saying an obvious name from our consensus top 3 prospects (Giolito, Cole and Goodwin), I’m going to throw out a couple other names that really intrigue me. Matt Skole lost all of 2013 by virtue of a freak injury but impressed last year; i’d like to see him bash his way into consideration for a call-up. I’d like to see what 2013 draftee Austin Voth can do in a full season; I like this guy as a sleeper, a potential Tim Hudson-esque mid-rotation starter who doesn’t get a ton of credit because of his size but suddenly is posting double-digit wins for your team. I’d like to see what Matthew Purke does this year; the shine is off this guy; I’d really like to see him put himself back into relevance with this organization. Like everyone else Stephen Souza has really elevated his status; what can he bring to the table if he gets an opportunity? And lastly we now know that fireballer Blake Treinen is in the AAA rotation; is he a behind-the-scenes important piece of rotation depth for this farm system now? 9. Who will reach majors first: Sammy Solis, A.J. Cole, Lucas Giolito or Matt Purke? Well, this one is easy to me; Sammy Solis is on the 40-man, is 25, and is already being talked about as being a potential loogy in 2014. After that I’d predict Purke (also by virtue of his 40-man placement); if Purke shows the team something or anything this year, he could earn a Sept 1 call-up to help in the pennant race. After that say Cole since he will be put on the 40-man this coming off-season (if not before) and then Giolito last; he’s not rule-5 eligible til 2016 and would have to pitch his way into relevance before then (much like Taylor Jordan did in 2013). 10. How many all-stars will the Nats have? Who? I’ll predict three: Strasburg, Desmond and Harper. 11. Total wins and what place in the division? 94 wins, 1st place in division. This could trend higher with every new Atlanta injury. Hitting in the clutch. The 2013 team to score 80 fewer runs than the magical 2012 team despite a lineup that seemed better on paper. A lot of this regression was due to the drop-off in bench production, but an awful lot of it was due to coming up weak in the clutch. In high-leverage batting situations (as defined by fangraphs), the Nats were dead last in 2013. This team needs to do better all the way up and down the lineup. We need Harper healthy. We need Span producing like he did in September. I’d like to see something better out of LaRoche in 2014. 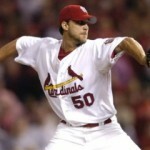 Give us that and all these great pitchers will look that much better. I enjoyed writing about our local players and their draft prospects in 2013 (full 2013 draft results for players with DC/MD/VA ties here). So here we go for a similar look in for 2014. Believe it or not, local High Schools kick off play this week, despite the 6 inches of snow we just got. Perfect Game just released their pre-season All-Atlantic Region team (and the Washington Post All-Met team did a nice review of it); it includes some names listed below in our local section. I’ll talk about local prep kids, then MD/VA college prospects and then branch out to a larger MD/VA prep collection of players mentioned on various draft prep lists (links to which are at the bottom). Jacob Bukauskas, a 16-yr old rising senior (he reclassified to skip a year of HS) who plays for Stone Bridge HS in Ashburn, is already up to 93 on the gun in showcase events and is going to graduate early to qualify for the 2014 draft. He is committed (incredibly early) to UNC, but you generally don’t graduate HS a year early so you can go play 3 years in college. #162 on MinorleagueBall’s list. Pre-season PG all-Atlantic 1st team. Justin Morris is a C from DeMatha HS who plays for the newly crowned 2013 PerfectGame national champions EvoShield Canes. He’s a Maryland commit but may improve his draft stock with a strong 2014 spring. #295 on minorleagueball’s list. Pre-season PG all-Atlantic 1st team. Tommy Doyle is a big (6’6″) RHP from my home town of Vienna, playing at Flint Hill Academy in Oakton. PG has him at 91 and he’s committed to UVA. I wonder if the competition he’ll face at the small private school Flint Hill will hamper scouting efforts. Not in minorleagueball’s top 300. Pre-season PG all-Atlantic 1st team. Brodie Leftridge, a CF from Highland, MD (outside of Columbia) but going to local power St. Johns Prep. Committed to Tennessee. Profiles as a leadoff/CF type; ran a sub 6.6 60 per perfect game. Ranked #256 on MinorleagueBall.com. Pre-season PG all-Atlantic 1st team. Slim pickings of local HS guys this year unfortunately. I may have to venture out to Ashburn to see Bukauskas throw. Derek Fisher is a lefty corner outfielder at UVA who passed up 6th round money out of HS and now projects as a possible mid 1st rounder. Law has him higher than others, ranked 14th on his top 50. MLBDraftInsider has him 16th, as does minorleagueball. But we have seen relative talent ranking does not always equate to draft positioning in the modern bonus-limit era. Minorleaguebaseball.com posted this profile of Fisher in early Feb, with a pretty detailed overview of his game and a prediction for middle-of-the-first round. Nonetheless, he profiles as a good college bat in a draft that doesn’t have a ton of them, and he’ll probably go high. Mark Zagunas, C from Virginia Tech, #41 on MinorleagueBall’s list. Nick Howard, RHP from UVA, #111 on MinorleagueBall’s list. He’s a weekend starter, but may be in trouble of losing his spot thanks to two standout sophomore starters who look to be your friday/saturday guys and the addition of freshman Connor Jones (who was a 1st round talent last year out of HS). Brandon Downes, CF from UVA, #145 on MinorleagueBall’s list. Mike Papi,1B/corner OF from UVA, #176 on MinorleagueBall’s list. 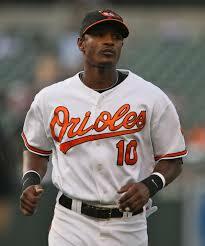 Troy Stokes, OF from UMaryland, #209 on MinorleagueBall’s list. 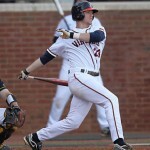 Brandon Cogswell, ss/2b from UVA, ranked #225 on MinorleagueBall’s list. K.J. Hockaday, SS from Harford Community College (which is in Bel Air, MD; I had to google it). #235 on MinorleagueBall’s list. Jake Stinnett, sr RHP from UMaryland, has started the season strong and is getting some notice. 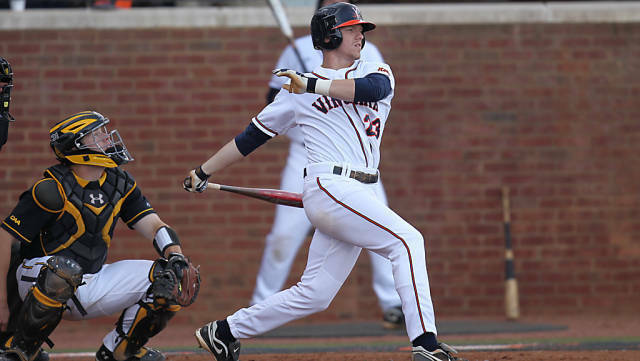 Five players in the top 225 draft prospects on UVA’s squad; no wonder they’re getting some heady pre-season praise (#1 on Baseball America’s pre-season rankings, ahead of NC State which boasts two potential top 5 overall picks). Keith Law wrote specifically about UVA’s talent pool 2/25/14, saying that they’ll likely have their top five guys drafted in the first 3 rounds this year. Charlie Cody is a 3B from the same Great Bridge HS in Chesapeake that just graduated Connor Jones. He’s committed to UVA. Sullivan has him as the #34 HS prospect in the country in mid 2013. He is known for his speed: a 6.6 60 time. It should be interesting to see how he fares this spring and whether his stock rises enough to merit a top draft pick. Here’s some video of a couple at-bats from baseballinstinct.com. Ranked only #208 on MinorleagueBall’s list. Pre-season PG all-Atlantic 1st team. Jeff Harding is a senior RHP from Cambridge, MD committed to South Carolina. PG has him up to 94 on the gun but he’s really undersized (listed as 5’11” 165). Sullivan lists him as #44 HS prospect in the nation in mid 2013. Minorleague ball has him at #75. He seems like a good bet to head to school. Fair or not, pitchers are considered too small these days unless they’re 6’4″. Pre-season PG all-Atlantic 1st team. Hunter Williams is a two-way lefty player from Cosby HS in Chesterfield, VA who has skills both on the mound at at the plate. He’s limited to first base in the field, which may make it tougher for him to get drafted and developed. 91 on the gun. Another UNC commit, it should be interesting to see which way he focuses. Minorleagueball has him at #103. Pre-season PG all-Atlantic 1st team. Jack Gerstenmaier is a SS from Freeman HS in Richmond with a UVA commit. #232 on MinorleagueBall’s list. Pre-season PG all-Atlantic 1st team. Devon Fisher is a solid catching prospect from Portsmouth, VA who is either at Greenbriar Christian Academy (a decent baseball development school) or Western Branch (per PG). UVA committed. He’s rising in the ranks by virtue of good showcase efforts. Pre-season PG all-Atlantic 1st team. Hunter Taylor is a C from a small HS on the Delmarva peninsula in Olney, VA (which I had to look up), who also plays with EvoShield and is committed to South Carolina. Pre-season PG all-Atlantic 1st team. Chase Pinder (brother of Va Tech 2013 2nd rounder Chad Pinder) is a senior SS from Poquoson, VA, committed to Clemson. Pre-season PG all-Atlantic 1st team. Taylor Lane is a taller SS/3B prospect also from Great Bridge HS in Chesapeake, committed to Florida. Pre-season PG all-Atlantic 1st team. Troy Stokes is an undersized OF with power from Calvert Hall College in Baltimore with a Maryland commit. Pre-season PG all-Atlantic 1st team. Derek Casey is an RHP from Mechanicsville, VA with a UVA commit. Ranked #223 on MinorleagueBall.com. Pre-season PG all-Atlantic 1st team. Lots of local guys on EvoShield; click here http://canesbaseball.net/canes-alumni/ for a look at their alumni. AAU/Travel baseball is taking over the world. Also, every guy listed here was on PG’s All-Atlantic team, so that’s clearly a good list to start from for prep interest. A reminder; there’s almost no baseball talent within the District itself. The DCPS baseball programs are in terrible shape (as talked about in this excellent WP Magazine article from a couple weeks ago), and the colleges within the city limits that do play baseball (GW, Georgetown in Division I, Gallaudet in Division III NEAC Conference and Catholic in Divison III Landmark Conference) are generally not power-house programs. Lastly, Here’s some links to draft prep lists that profile national high school talents. So, big news out of camp today is Matt Williams announced decision to “start the season” with Ross Detwiler in the bullpen. Adam Kilgore broke the news earlier today and now it’s been picked up by some of the bigger sites and other Nats beat reporters. I’m on record with having predicted Detwiler for the 5th starter, dating back to my (too-early) December 2013 post predicting the rotations across the system. I stand by my arguments made at the time, but cannot argue with decisions made by those who watch these guys day-in and day-out. Detwiler’s stats this spring leave something to be desired (insert standard anti-Spring training stats/short sample size arguments here), and we all know that a) the team needs another lefty reliever, b) Detwiler’s reliever stats are excellent, and c) the Bullpen was pretty bad last year and needed improving anyway. Detwiler in the bullpen definitely improves the group as a whole, and opens up a spot for someone unexpected to start the season in the rotation. So, now what are we predicting? Something like this? Or are we thinking that Roark may pip Jordan for the 5th spot, which would give perhaps a guy like Aaron Barrett (whose Spring stats are stellar) or maybe even fan favorite Christian Garcia the 7th spot in the pen for the time being while Jordan heads to AAA? 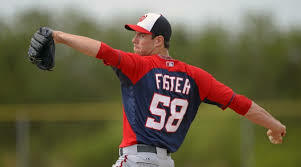 Or, is Fister starting the year on the D/L as well, meaning both Jordan and Roark may be pressed into action? 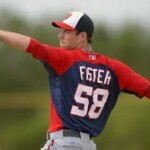 Or, if Fister does hit the D/L is Detwiler getting pulled back into the fray as a starter again? Or do we throw a NRI a bone and keep someone like Michael Gonzalez and/or Luis Ayala? (doubtful on these last two guys: Gonzalez has yet to pitch in a game and Ayala’s gotten shelled). If it were me, I”d go with Roark in the rotation until he falters (if he falters), stick Jordan in AAA to continue getting starts on a regular basis, keep Detwiler as 2nd lefty/long man and give a hard-throwing righty like Garcia a shot to show us what he’s got at the MLB level. Thoughts? First controversial move by our manager; I wonder how the players are taking it. Another week, another Boswell chat (this time 3/10/14). Not much reaction to my big rotation rankings post yesterday; maybe 4800 words is too many Here’s about a 1000 instead about Nats stuff instead of overall baseball stuff. Q: Interested in your thoughts on the Fister elbow inflammation? A: I’d say that I’m cautiously concerned about Doug Fister. It wasn’t a grimace-induced injury like what happened to Kris Medlen. You could easily explain this away as a typical spring training injury. I think the best answer is “we just have to wait and see.” If Fister misses his next start … and isn’t throwing between starts, watch out. As we have already learned … he’s already feeling good enough to throw today (Tuesday 3/11/14) so maybe it was just a scare. Boswell accuses the Nats of being “underly worried” about its players’ ST maladies in the past, and then says we’ll have to wait and see. He does also reference Medlen though. Q: Does Ross Detwiler being the only lefty in the 5th starter competition give him any advantage? A: Maybe. Maybe a little. I wouldn’t mind having a 2nd lefty starter instead of a 4th righty starter, but the real reason Ross Detwiler will win the 5th starter role will come down more to options and performance versus his handedness. This is well-worn territory though (see previous Boswell chat here and rotation projections here) so we won’t go into it greatly. Boswell has a good point; Detwiler’s being left-handed is a disadvantage b/c the team knows they can stick him in the pen and he’ll instantly be a valuable reliever. And then I believe Boswel predicts that Tanner Roark is winning the 5th starter spot and Detwiler is heading to the pen. Wow. Q: Is MLB stalling on the MASN issue b/c they’re waiting for Peter Angelos to die? I didn’t want to phrase this “question” this way, but it was the most succinct. Answer is, “No even the bastards that run MLB aren’t that crass.” At least not overtly. I think the real answer is that Bud Selig realizes just how impossible this situation is (and, frankly, the SF-Oakland-San Jose issue as well) from a legal standpoint and he’s going to just keep on waiting for one side to call out “chicken” and propose something. We talked more at length about this issue a month ago when the Jonah Keri revalation surfaced, and (of course) nothing new has happened since. Boswell does call this an “ultra cynical” view. Q: Why was Matt Skole cut so quickly? A: Because he needs at-bats, and he’s not going to get as many of them the further we get into spring training as the veterans want 3ABs/game instead of one. He wasn’t going to make the team; why does anyone care when he was “cut” from the major league squad? I dunno; the whole “cuts issue” in spring training is faintly ridiculous for me anyway; is the guy on the 40-man roster? No? Then he’s not making this team out of Viera. This isn’t the cattle-call that we had for pitchers in 2008 when “cuts” actually meant something closer to when your high school team had cuts. Boswell agrees … and then gushes about Stephen Souza. Q: Does Strasburg’s new slider put undue stress on the elbow? A: What google article did this guy find that told him that?? I’ve never bought that argument and here’s why: I never really learned how to throw a curve ball. I didn’t really realize this until I was an adult, but the “curves” I always thought I was throwing as a kid? Yeah; they were sliders. I held the ball with a curve grip and just let it tumble out of my arm, bringing my arm across my body without snapping my wrist. And lemme tell you what: throwing a slider in this fashion was a heck of a lot easier on my arm than it was to violently snap my wrist and throw a curve ball, as I learned later on. Personally I’ve always thought the adage, “sliders hurt your arm” was B.S. Boswell hedges, saying that there’s different ways to throw a slider. Q: Does it seem to you that Tanner Roark doesn’t get the respect his stats would seem to deserve? A: Yes, absolutely. I wish I had a nickel every time I heard someone completely discount his 50+ innings of stellar work last September and invent some reason why some minor leaguer with 12 innings of experience (ahem, Christian Garcia) should be in the MLB bullpen instead of Roark. Why does this keep happening? Probably because he was an afte- thought, a lowly right-handed middle reliever without an eye-opening velocity or pitch. All he does is command his fastball, keep it low and earn grounders. Yes Detwiler (his 5th starter competition) was a first rounder … but I think at this point in everyone’s development, the team wants the best 25 guys on the field and aren’t really that concerned about how much bonus money they were paid 8 years ago. I think we should all look up the definition of “sunk cost” and move on. Boswell thinks Roark is a classic late bloomer. Q: Bryce Harper said that, with a healthy knee, he should be able to stay in on left handed pitching. What type of performance should we expect to see with him against lefties, that will be indicative of a breakout season from him? A: I hope this is true; he was pretty bad last year against lefties. I couldn’t easily find his lefty splits for just April before his injuries … that’d be an interesting split. I have no idea if this is true; it could be. Something tells me his knee pain was worse than he really let on about, all season. Boswell points out Bryce’s rookie season splits against lefties were better. 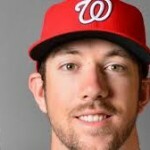 Q: What is going to happen with Tyler Moore this year? A: At this point I have no idea; maybe just PH duties off the bench and occasional mop-up duty? We’ve covered this territory many times before. 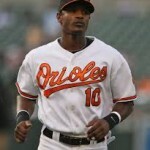 Does it make sense to keep a third outfielder on the bench over a utility guy? Not to me … if I was constructing this team i’d be sending Moore to AAA or looking for a trade and keeping another guy who can play infield. Boswell thinks a trade to a second division team that can start him is in order. 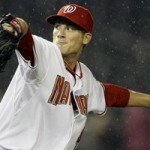 Q: If “the window” is only open for a short time, how do you justify not finding a way to keep Strasburg going in 2012? A: (the question was a bit longer but basically calls out Boswell for advising a double standard in terms of approving the Stephen Strasburg shutdown but also urging the Nats to “hurry up” and take advantage of this current “window” of opportunity). Another topic that’s well-oiled; the Strasburg shutdown. Honestly I don’t think the Nats truly feel that they have a finite “window” right now; yes there’s a huge transition year after 2016 … is that the end of a window or merely a way to move onto the next phase? Boswell points out some facts supporting the Nats 2012 shutdown decision … it is nice to hear someone arguing FOR the health of a player.